One of the units working at a plant in Saudi Arabia. A key Saudi service provider reports that all of its 37 new Genie machines have been in high demand since they were delivered earlier this year. 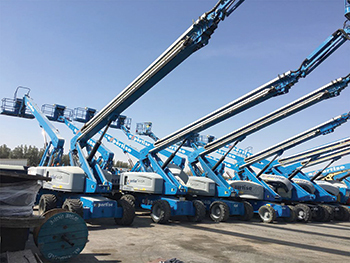 Expertise Contracting Company, one of Saudi Arabia’s leading industrial service providers, recently took delivery of 37 Genie self-propelled telescopic boom lifts. Comprising a mix of Genie S-65 and S-85 boom lifts offering maximum working heights from 20 to 27.9 m, the delivery notably included the first two Genie Xtra Capacity (XC) SX-135 XC boom lifts in the country. These two Genie SX-135 XC units, which combine more upreach and outreach than any other machine in this category on the market, have been under such high demand that Expertise plans to invest in more Genie XC machines by the end of this year, according to Genie, a brand of Terex Corporation. With this recent delivery, Expertise now counts an aerial access fleet of 85 Genie units. FROM LEFT: Ajmal, Ashraf, and Cooke, following the delivery of the units. 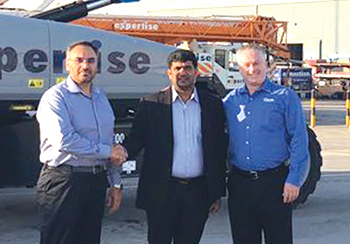 “We have always been extremely satisfied with Genie aerial work platforms (AWPs), as well as the reliable service support provided by our local Genie team and their authorised service providers in the region,” says Mohammed Ashraf, director of Industrial Supplies for Expertise. Since their delivery earlier this year, all 37 new Genie machines have been in high demand from customers operating in a broad range of sectors in the region, among which is Saudi Basic Industries Corporation (Sabic), one of the country’s largest employers specialised in the manufacture of fertilisers, chemicals, polymers and metals. In fact, Expertise purchased its two Genie SX-135 XC telescopic boom lifts as part of a maintenance contract with Sabic. “Offering from 300 kg to 454 kg lift capacity, like all Genie XC machines, the Genie SX-135 XC boom lift provides 32 per cent more load capacity than the industry standard to raise up to three people and more tools and materials,” says a spokesman for Genie. Expertise took delivery of 37 Genie telescopic boom lifts earlier this year. “As a result, the number of up and down trips to reload is significantly reduced which really saves time and increases productivity. But, this is not all. Adding an extra 3 m, plus 125 degrees of jib articulation to the unit’s 43 m working height and market-leading 27.43 m outreach, the telescopic Genie Jib Extend is also a unique feature that is ideal for high precision access in hard-to-reach places,” he says. Additionally, as applies to most Genie boom lifts, all units within this new delivery came equipped with the factory-installed Genie Lift Guard Contact Alarm, a secondary operator protective system. For Expertise, this standard feature meant that the machines already complied with the state oil and gas company Aramco’s safety regulations as part of which the installation of secondary operator protection is mandatory. Designed for heavy lifting work at height, the Genie SX-135 XC boom lift is a perfect fit for facilities management and construction applications on stadiums, sports arenas, industrial, telecommunications and utilities sites, among others. 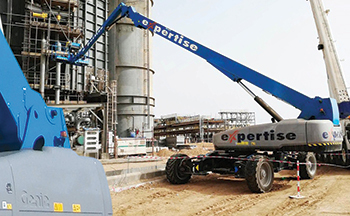 “For the first time in Saudi Arabia, thanks to our new Genie SX-135 XC boom lifts, Expertise now offers customers the ability to do more and work faster and more easily using a single machine,” says Ashraf. “Feedback from Sabic has been great. They are more than satisfied by the machines’ capabilities that have proved a perfect fit for the maintenance of their sites. As far as we’re concerned, the Genie SX-135 XC boom is a great investment. In fact so much so that we’re already considering acquiring several more Genie Xtra Capacity units before the end of this year,” he concludes.